Pri izdelavi te voščilnice so mi ostale ledene snežinke in eno sem uporabila na CAS voščilnici, s katero se imela le 10 minut dela. Na belo osnovo sem s čopičem preko stenci šablone nanesla Distress Oxide, s črno blazinico sem odtisnila voščilo in z vročim lepilom pričvrstila ledeno snežinko. 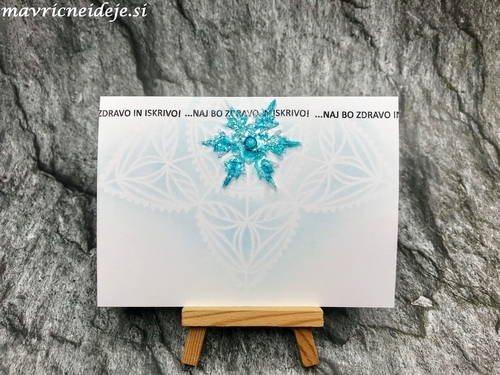 Za piko na i sem v center stisnila pošteno kapljico Nuvo Glitter Drops White Blizzard. Kako sem izdelala snežinko si lahko pogledate v videu. Such a pretty, sparkly snowflake. 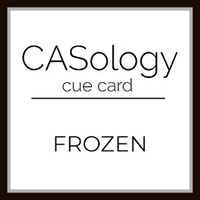 Thanks for playing along with us on the CASology Challenge blog. This is gorgeous. I love the stencil with the sparkly die cut set on top of it. Looks great with the sentiment across the top. Thanks so much for playing with us at Addicted To CAS. So pretty! I love the shine on your snow! Thanks for sharing at ATCAS! What a gorgeous and sparkly snowflake ! Love the soft stencilled background to pop it up. Fabulous CAS design. Thanks so much for sharing and for playing along at Less is More. Wow!! This is so gorgeous . Love your pretty stenciling and the sparkly snowflake ! Lovely!! Thanks for joining us at ATCAS challenge. Hugs! Raga.